In the spotlight during the eighteenth century, caning came back in force this year. In recent years this technique reappeared little bit and it is everywhere now. Want to know more about the decorative trend of caning? It’s the right article for you! The decorative trend of caning : What is caning? It is a rattan weave in thin strips, creating a very specific pattern to give a frame, which once stretched, can serve as a seat or other. A must of the eighteenth century fallen into disuse, then back in the 70s, then again forgotten and back again! You will understand, any mode is cyclical, which is up to date a day is not a few times later, then it comes back to fashion etc etc! In fact everything is a question of reinterpretation, of course the furniture in caning of the different times are not the same, they have evolved, as our societies. So do not hesitate to reinterpret it yourself by finding flea market furniture with caning and repainting and changing fabrics! Moreover, if you like manual work, traditional caning is no more complicated than knitting and sewing: just weave the rattan threads and you’re done so if you’re interested, get started! If the weaving itself does not motivate you more than that, you can find at LEROY MERLIN or M. DIY caning by the meter and make your own creations. TIP “Deco trend of caning”: Why not take a meter of caning, frame it, paint it as an abstract painting. Or make a table on which you hang your photos, let talk your creativity, you will surely do wonders! Caning is therefore this new decorative trend, which comes back in 2018 and is perfect for a vintage atmosphere. This craze for this technique is also surely due to the fact that we notice the desire to return to natural materials. Interior decoration brands have reinterpreted this technique in many ways that show the inexhaustible creativity of some designers! Of course we will find the backrest and seat chair or chair, but also buffet, coffee table or headboard. This decorative trend of caning brings a delicate and convivial touch to your interior. By customizing old furniture you will also give them a second youth and your home sweet home of personalized originality. A screen in caning can be the most beautiful effect in your living room or in your bathroom: original and vintage at the same time, it will give a small shabby style to your interior decoration. Coffee table CASSINA at 385 €: a perfect mix of modernity by these nestings and conviviality by the caning (photo in head of article). 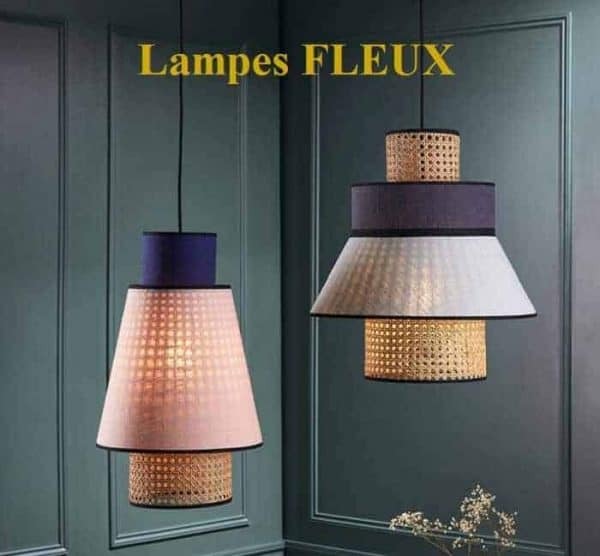 FLEUX lamps at € 139 and € 153: this beautiful duo of suspensions marries the caning of linen softness in very modern cold colors that accentuate the graphic effect of everything. 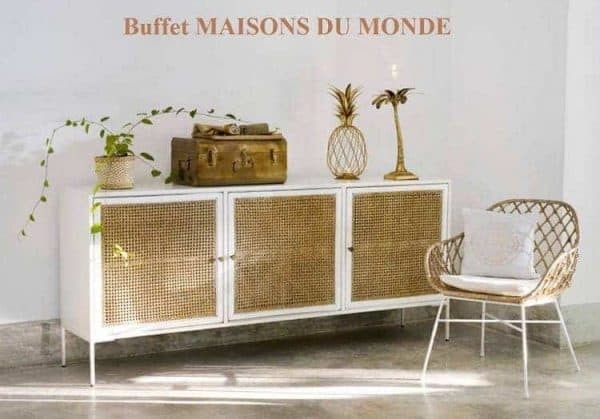 Buffet MAISONS DU MONDE at 699 €: ideal in a clear and natural interior, this buffet combines pragmatism storage and aesthetics! 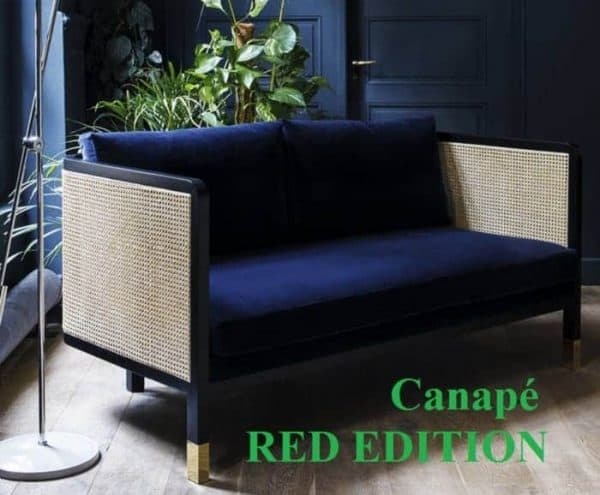 RED EDITION sofa 390 €: totally modern with its clean lines, velvet and midnight blue! 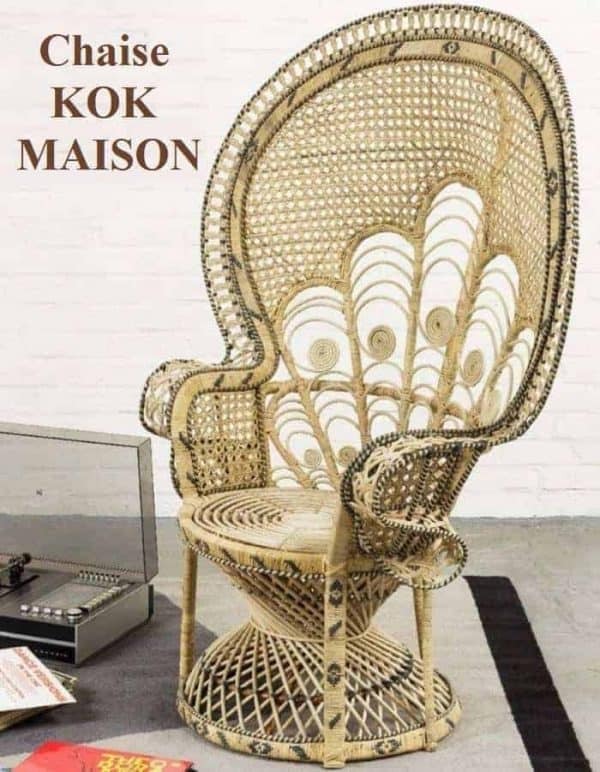 KOK HOUSE CHAIR at 795 €: we can not talk about the decorative trend of caning without talking about the famous chair Emmanuelle, who still has so many admirers!